Salvador Dali’ and Gala Eluard. London: Two Dali prints soon to be available on The Story by Saffronart are a great example of one artist’s response to the work of another. Here, William Shakespeare, centuries after his death, manages to inspire the imagination and creativity of the great surrealist artist Salvador Dali with his words and poetry. Dalì, mostly known for his surrealist works which he created using several different media, from painting to sculpture and film, also demonstrated great skill with more ‘traditional’ forms of art like the present prints. He joined the surrealist group in 1929 of which he was one of the most outstanding and controversial members. There he met his future wife and muse Gala. In 1939 he left the Surrealist group and fled to America with Gala where he adopted a different approach to art, rejecting modernism and experimenting different art traditions. Salvador Dali, The Persistance of Memory, 1931. Given the link of Surrealism with literature, Dalì’s interest in Shakespeare’s oeuvre is not surprising. In fact, the artist also illustrated other literary masterpieces such as “The Divine Comedy” by Dante and Cervantes’ “Don Quixote”. One of the prints on offer is an illustration of Shakespeare’s “The Tempest” written around 1610-1611. 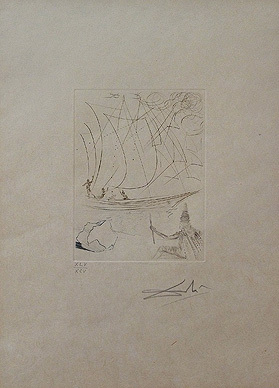 In this print, Dali represents the main scene of the play, where Prospero conjures up the tempest. He is depicted on the right hand side of the print, while in the background, a boat struggles against the blowing winds and stormy sea. The second print is an illustration of the play “Henry IV” which belongs to a series of four historical dramas. Written between 1596 and1599, this play tackles mirrors the political situation of the time and the problems around the succession after Queen Elizabeth I.
William Shakespeare (1564-1616) is considered the greatest playwright in the history of English literature, and in the 19th century his work became the canon for western literature. 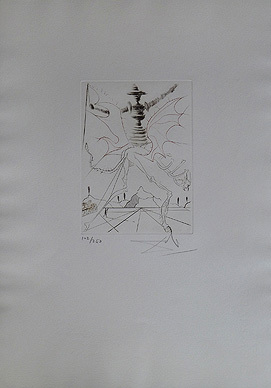 An exhibition on Shakespeare prints by Salvador Dalì titled “Much Ado About Shakespeare” will be held at the Dalì Museum, Florida, in January 2013. So why not enjoy one of the Shakespeare inspired prints from your own collection? It is an occasion to not be missed!